Plans to generate electricity from the world’s first batch of tidal lagoon power plants have surfaced in Britain. The power stations could yield 8 percent of the UK’s electricity requirements, experts suggest. 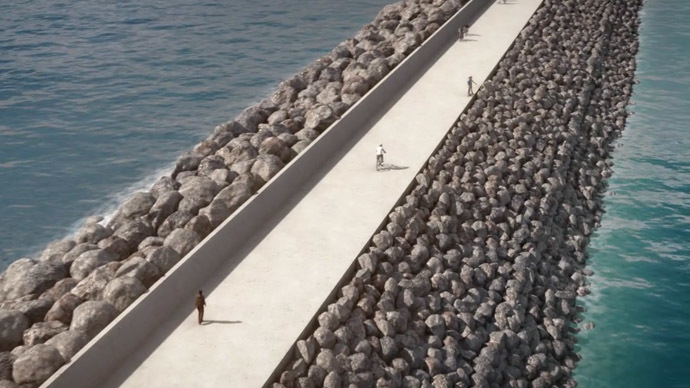 Spanning from Wales to Cumbria, the power plants would harness giant walls to capture incoming and outgoing tides. The weight of nearby sea water would power turbines and produce electricity in the process. A £1bn Swansea program, estimated to be capable of producing enough energy for 155,000 households, is currently being planned. Britain’s Energy Secretary Ed Davey has expressed interest in backing the project. Although the cost of generating electricity from the program will be high, the company behind the development says subsequent lagoons will be able to produce electricity far more cheaply. The firm is planning a total of six lagoons in the UK – costing £30bn. It says the power plants could potentially yield 8 percent of the union’s electricity requirements. Potential lagoon sites are Cardiff, Newport and Colwyn Bay in Wales; Bridgwater in Somerset; and West Cumbria. Each project will require advanced engineering. In Swansea, the sea wall due to contain the lagoon will span over five miles and stretch two miles out to sea.Associated costs would be shouldered by electricity bill-payers under a current government scheme to develop greater levels of low-carbon, homegrown energy. Tidal Lagoon Power, the new energy firm behind the development, is currently negotiating with the government what it should charge customers for its power. A former plan to construct a tidal lagoon on the Severn, Britain’s longest river, was blocked after environmentalists warned that it would impede upon the daily exposure of mud banks that are essential for wading birds. However, the Swansea-based lagoon development does not interfere with estuaries, and allows tides to flow normally. Gareth Clubb, Director of Friends of the Earth Cymru, said the group is largely in favor of the project planned for Swansea. By contrast, fishermen have expressed concern about the project’s potential impacts on fish migrating to reproduce in nearby rivers. “We would very strongly oppose any plans for this and other lagoons down the South Wales coast,” he told the BBC.